Doors are an important part of a total solution at the heart of a hospital or food business. Therefore, customers are looking for a strategic partner who can support them in this. Metaflex helps its customers to ensure the quality and also provides process support to meet the high standards and quality requirements needed in these sectors. Metaflex focuses every day on the optimization of these processes, both internally and for its customers. Meyn Polska has been working with Metaflex for more than six years. 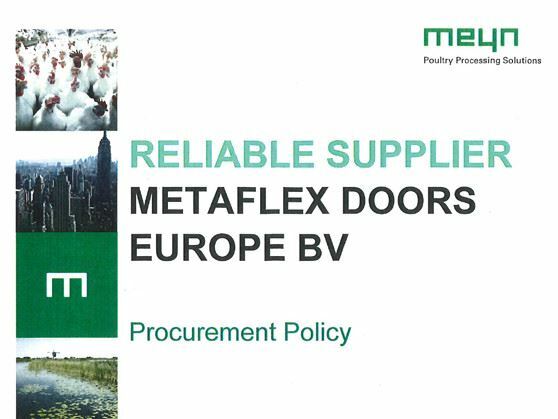 The Metaflex door solutions are applied by Meyn in various European projects. Metaflex scores high on the criteria Meyn imposes on its suppliers. Therefore, Metaflex recently received a certificate from Meyn: Procurement Policy - Reliable supplier in 2016. A result we are proud of!